From the 17th century onward, astronomers made some profound discoveries around the planet Saturn, which they believed was the most distant planet of the Solar System at the time. Christiaan Huygens and Giovanni Domenico Cassini were the first, spotting the largest moons of Saturn – Titan, Tethys, Dione, Rhea and Iapetus. More discoveries followed; and today, what we recognized as the Saturn system includes 62 confirmed satellites. What we know of this system has grown considerably in recent decades, thanks to missions like Voyager and Cassini. And with this knowledge has come multiple proposals that claim how Saturn’s moons should someday be colonized. In addition to boasting the only body other than Earth to have a dense, nitrogen-rich atmosphere, there are also abundant resources in this system that could be harnessed. Much like the idea of colonizing the Moon, Mars, the moons of Jupiter, and other bodies in the Solar System, the idea of establishing colonies on Saturn’s moons has been explored extensively in science fiction. At the same time, scientific proposals have been made that emphasize how colonies would benefit humanity, allowing us to mount missions deeper into space and ushering in an age of abundance! The colonization of Saturn has been a recurring theme in science fiction over the decades. For example, in Arthur C. Clarke’s 1976 novel Imperial Earth, Titan is home to a human colony of 250,000 people. The colony plays a vital role in commerce, where hydrogen is taken from the atmosphere of Saturn and used as fuel for interplanetary travel. In Piers Anthony’s Bio of a Space Tyrant series (1983-2001), Saturn’s moons have been colonized by various nations in a post-diaspora era. In this story, Titan has been colonized by the Japanese, whereas Saturn has been colonized by the Russians, Chinese, and other former Asian nations. In the novel Titan (1997) by Stephen Baxter, the plot centers on a NASA mission to Titan which must struggle to survive after crash landing on the surface. In the first few chapters of Stanislaw Lem’s Fiasco (1986), a character ends up frozen on the surface of Titan, where they are stuck for several hundred years. In Kim Stanley Robinson’s Mars Trilogy (1996), nitrogen from Titan is used in the terraforming of Mars. In his novel 2312 (2012), humanity has colonized several of Saturn’s moons, which includes Titan and Iapetus. Several references are made to the “Enceladian biota” in the story as well, which are microscopic alien organisms that some humans ingest because of their assumed medicinal value. 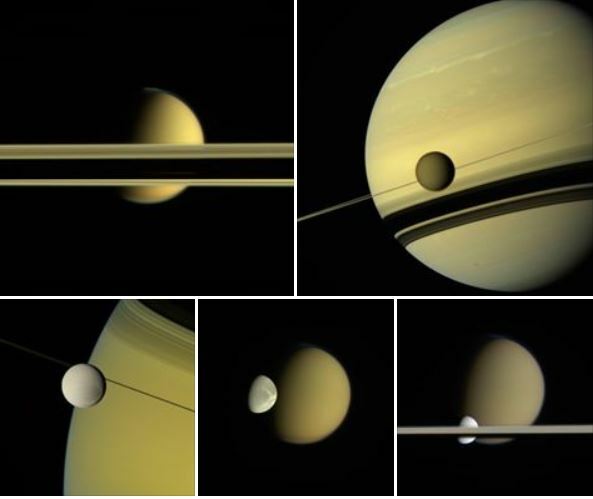 As part of his Grand Tour Series, Ben Bova’s novels Saturn (2003) and Titan (2006) address the colonization of the Cronian system. In these stories, Titan is being explored by an artificially intelligent rover which mysteriously begins malfunctioning, while a mobile human Space Colony explores the Rings and other moons. In his book Entering Space: Creating a Spacefaring Civilization (1999), Robert Zubrin advocated colonizing the outer Solar System, a plan which included mining the atmospheres of the outer planets and establishing colonies on their moons. In addition to Uranus and Neptune, Saturn was designated as one of the largest sources of deuterium and helium-3, which could drive the pending fusion economy. He further identified Saturn as being the most important and most valuable of the three, because of its relative proximity, low radiation, and excellent system of moons. Zubrin claimed that Titan is a prime candidate for colonization because it is the only moon in the Solar System to have a dense atmosphere and is rich in carbon-bearing compounds. On March 9th, 2006, NASA’s Cassini space probe found possible evidence of liquid water on Enceladus, which was confirmed by NASA in 2014. 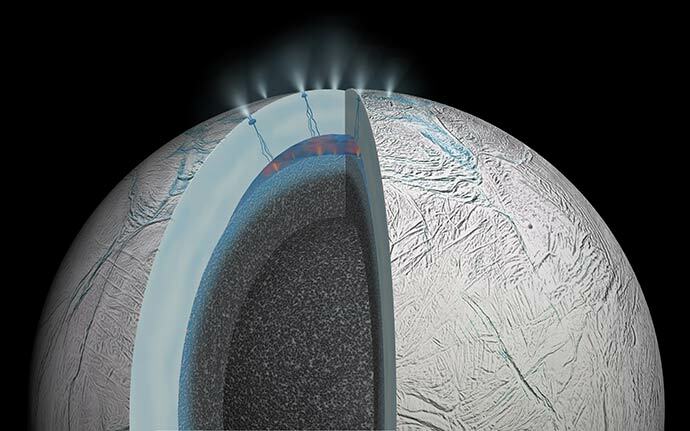 According to data derived from the probe, this water emerges from jets around Enceladus’ southern pole, and is no more than tens of meters below the surface in certain locations. This would would make collecting water considerably easier than on a moon like Europa, where the ice sheet is several km thick. Data obtained by Cassini also pointed towards the presence of volatile and organic molecules. And Enceladus also has a higher density than many of Saturn’s moons, which indicates that it has a larger average silicate core. All of these resources would prove very useful for the sake of constructing a colony and providing basic operations. 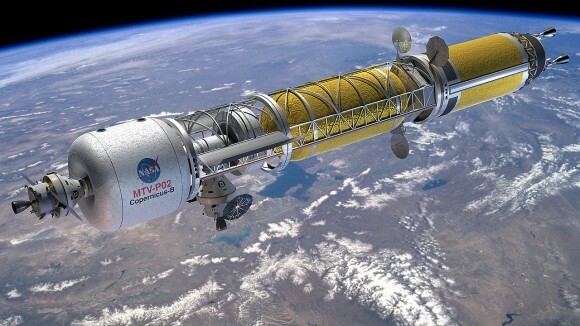 In October of 2012, Elon Musk unveiled his concept for a Mars Colonial Transporter (MCT), which was central to his long-term goal of colonizing Mars. At the time, Musk stated that the first unmanned flight of the Mars transport spacecraft would take place in 2022, followed by the first manned MCT mission departing in 2024. In September 2016, during the 2016 International Astronautical Congress, Musk revealed further details of his plan, which included the design for an Interplanetary Transport System (ITS) and estimated costs. This system, which was originally intended to transport settlers to Mars, had evolved in its role to transport human beings to more distant locations in the Solar System – which could include the Jovian and Cronian moons. Compared to other locations in the Solar System – like the Jovian system – Saturn’s largest moons are exposed to considerably less radiation. For instance, Jupiter’s moons of Io, Ganymede and Europa are all subject to intense radiation from Jupiter’s magnetic field – ranging from 3600 to 8 rems day. This amount of exposure would be fatal (or at least very hazardous) to human beings, requiring that significant countermeasures be in place. In contrast, Saturn’s radiation belts are significantly weaker than Jupiter’s – with an equatorial field strength of 0.2 gauss (20 microtesla) compared to Jupiter’s 4.28 gauss (428 microtesla). This field extends from about 139,000 km from Saturn’s center out to a distance of about 362,000 km – compared to Jupiter’s, which extends to a distance of about 3 million km. Of Saturn’s largest moons, Mimas and Enceladus fall within this belt, while Dione, Rhea, Titan, and Iapetus all have orbits that place them from just outside of Saturn’s radiation belts to well beyond it. Titan, for example, orbits Saturn at an average distance (semi-major axis) of 1,221,870 km, putting it safely beyond the reach of the gas giant’s energetic particles. And its thick atmosphere may be enough to shield residents from cosmic rays. In addition, frozen volatiles and methane harvested from Saturn’s moons could be used for the sake of terraforming other locations in the Solar System. In the case of Mars, nitrogen, ammonia and methane have been suggested as a means of thickening the atmosphere and triggering a greenhouse effect to warm the planet. This would cause water ice and frozen CO² at the poles to sublimate – creating a self-sustaining process of ecological change. Colonies on Saturn’s moons could also serve as bases for harvesting deuterium and helium-3 from Saturn’s atmosphere. The abundant sources of water ice on these moons could also be used to make rocket fuel, thus serving as stopover and refueling points. In this way, a colonizing the Saturn system could fuel Earth’s economy, and the facilitate exploration deeper into the outer Solar System. Naturally, there are numerous challenges to colonizing Saturn’s moons. These include the distance involved, the necessary resources and infrastructure, and the natural hazards colonies on these moons would have to deal with. For starters, while Saturn may be abundant in resources and closer to Earth than either Uranus or Neptune, it is still very far. 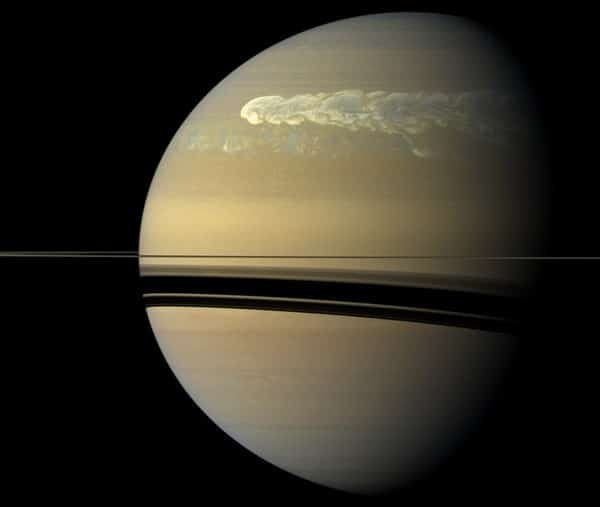 On average, Saturn is approximately 1,429 billion km away from Earth; or ~8.5 AU, the equivalent of eight and a half times the average distance between the Earth and the Sun. To put that in perspective, it took the Voyager 1 probe roughly thirty-eight months to reach the Saturn system from Earth. For crewed spacecraft, carrying colonists and all the equipment needed to colonize the surface, it would take considerably longer to get there. These ships, in order to avoid being overly large and expensive, would need to rely on cryogenics or hibernation-related technology in order to save room on storage and accommodations. While this sort of technology is being investigated for crewed missions to Mars, it is still very much in the research and development phase. Any vessels involved in the colonization efforts, or used to ship resources to and from the Cronian system, would also need to have advanced propulsion systems to ensure that they could make the trips in a realistic amount of time. Given the distances involved, this would likely require rockets that used nuclear-thermal propulsion, or something even more advanced (like anti-matter rockets). And while the former is technically feasible, no such propulsion systems have been built just yet. Anything more advanced would require many more years of research and development, and a major commitment in resources. All of this, in turn, raises the crucial issue of infrastructure. Basically, any fleet operating between Earth and Saturn would require a network of bases between here and there to keep them supplied and fueled. So really, any plans to colonize Saturn’s moons would have to wait upon the creation of permanent bases on the Moon, Mars, the Asteroid Belt, and most likely the Jovian moons. This process would be punitively expensive by current standards and (again) would require a fleet of ships with advanced drive systems. And while radiation is not a major threat in the Cronian system (unlike around Jupiter), the moons have been subject to a great deal of impacts over the course of their history. As a result, any settlements built on the surface would likely need additional protection in orbit, like a string of defensive satellites that could redirect comets and asteroids before they reached orbit. Given its abundant resources, and the opportunities it would present for exploring deeper into the Solar System (and maybe even beyond), Saturn and its system of moons is nothing short of a major prize. On top of that, the prospect of colonizing there is a lot more appealing than other locations that come with greater hazards (i.e. Jupiter’s moons). However, such an effort would be daunting and would require a massive multi-generational commitment. And any such effort would most likely have to wait upon the construction of colonies and/or bases in locations closer to Earth first – such as on the Moon, Mars, the Asteroid Belt, and around Jupiter. But we can certainly hold out hope for the long run, can’t we?